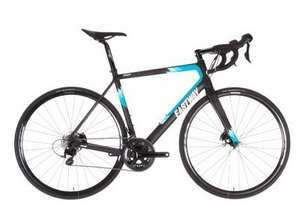 Not a cheap bike but a cracking deal if you are after a new road bike. Eastway (Wiggles own brand) Zener D2 comes with everything you could want on a carbon framed road bike for under £900. Spec is good but Jesus... That is the ugliest paint I've seen in some time! Horrible. Damn, that's a well spec'd bike for the price. Must not buy....must not buy....fight n+1. Good spec and price. 105 and hydraulic disc brakes under a grand is quite a bargain. The complete internal cabling [is impressive. Even in the forks! I bought a disc brake bike and wasn't that impressed as the discs kept catching and needing adjusting. Is that typical or just my shoddy setup? I bought a disc brake bike and wasn't that impressed as the discs kept … I bought a disc brake bike and wasn't that impressed as the discs kept catching and needing adjusting. Is that typical or just my shoddy setup? Sounds like a shoddy setup to be honest. First time for discs on the roadie but had them for the last 2 years on my hybrid and they've been absolutely faultless over just over a year and 1000 miles of trails. isn't the Cube deal better and still under 1000 quids.? which one would you prefer? I thought that too, looks very nice. Spec is pretty much the same and £100 more but looks great. I thought that too, looks very nice. Spec is pretty much the same and … I thought that too, looks very nice. Spec is pretty much the same and £100 more but looks great. This bike was £845 until the other day. So it may drop again. Though if there's only a few left in your size don't wait around! Were they hydraulic disc brakes or mechanical? Lots of people have problems with mechanical discs and I think it's becoming the general view that they may be more trouble than they are worth...and sometimes downright dangerous. I was riding with a friend in wet, wintry conditions and after a while her mechanical disc brakes just weren't working at all. It took a lot of fiddling about by one of the more mechanically-minded riders to sort out. Hydraulic brakes are a different kettle of fish. Were they hydraulic disc brakes or mechanical? Lots of people have … Were they hydraulic disc brakes or mechanical? Lots of people have problems with mechanical discs and I think it's becoming the general view that they may be more trouble than they are worth...and sometimes downright dangerous. I was riding with a friend in wet, wintry conditions and after a while her mechanical disc brakes just weren't working at all. It took a lot of fiddling about by one of the more mechanically-minded riders to sort out. Hydraulic brakes are a different kettle of fish. Yup. That would explain your problems. The Wiggle Bike has hydraulic disc brakes which should be much more reliable. They can catch if warped, or the calliper mounting surface isn't perfectly flat, or a wheel out of true, qr skewers not quite at the right tension etc. That's a cracking deal if you are after a 50/58 cm frame, nice looking bike too but why oh why do they use white handle bar tape? That's a cracking deal if you are after a 50/58 cm frame, nice looking … That's a cracking deal if you are after a 50/58 cm frame, nice looking bike too but why oh why do they use white handle bar tape? SKS Raceblades will sort you out. If you don't want to spend as much there is the D3 with Tiagra gears. Its £245 less, plenty of money to upgrade the mechanical discs if you find the TRP Spyre(supposedly the best mechanical ones)fitted not to your liking. Although it may be worth swapping the pads first as there are a few reports saying the original pads are not great. A set trp spyre seem to sell for £60+ on ebay, so will help reduce the cost of the replacements, perhaps the TRP Hy-Rd. Arrived today, not ridden yet but looks great and so light. I'm looking forward to taking her out. When I follow the link I see the 50cm, 52cm and 60cm versions available for £895. When I follow the link I see the 50cm, 52cm and 60cm versions available … When I follow the link I see the 50cm, 52cm and 60cm versions available for £895. My mistake, I mistaken the CUBE from #11. There's a £20 code for the Cube at Rutland - ATTAIN20.